Animal feeding operations are the most likely type of animal agriculture operations to be subject to rules and regulations. Most of these center around the manure handling and storage practices and equipment. 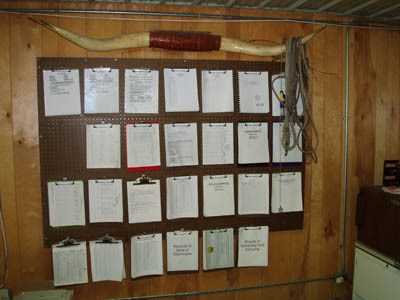 Record keeping and inspections are the cornerstone of compliance efforts by livestock and poultry producers. Record keeping and inspections are inextricably linked through the permit and nutrient management plan. In large part, only records can show an inspector that the operation is following its nutrient management plan (NMP) and permit requirements. Physical evidence of compliance or violations may only play a small part in many cases. The NMP is only a plan and describes many issues in general terms, however records allow the producer to manage very specifically and document that the intent of the NMP has been followed. Record keeping also allows you to document small changes in implementation of the NMP that could be the result of unseasonable weather and other unexpected influences. When all is said and done, an operation with well organized and complete records that document compliance with the permit and NMP, and where there is no physical evidence of an un-permitted discharge should pass an inspection with flying colors. Record keeping requirements can vary by state; however, it will be very likely that permitted operations will at a minimum be required to maintain: a basic NMP, with supporting materials and records on how the plan was followed. A CAFO, covered by a National Pollutant Discharge Elimination System (NPDES) permit (even if administered by a state) has very prescriptive record keeping requirements. The EPA CAFO brochure titled, “What Are the Federal Record-Keeping and Reporting Requirements” outlines these requirements, however the final word on what is required will be described in the permit. General records include: manure generation and inventory; manure and waste water transfers; manure storage inspections; storage capacity and levels; amounts and dates of any discharges; and mortality management. The remaining records are linked to land application and determination of rates. They include: Manure and wastewater analysis; soil tests; crop yield expectations; rate calculation method (nutrient budgets); actual application locations, date and amounts; weather conditions; and equipment inspections and calibrations. The LPES Curriculum includes an excellent fact sheet on record keeping titled, What Records Must I Maintain for Land Application? ], fact sheet #26. Several sample record keeping forms may be viewed and downloaded at the UGA AWARE Team site. The records described in the previous paragraph may be reviewed during an inspection. However, many of them will also be summarized and reported to EPA or the state permitting authority on an annual basis (CAFO Reports). The same EPA brochure explains these requirements. Briefly, they include: animal inventory; annual manure production; annual manure export; acres of land applied to and acres of land included in the NMP; documentation of any discharges; and is there a valid NMP for the operation. Records have many other benefits beyond simply complying with the permit and validating the NMP. Records can assist in making important business decisions that impact the bottom line. New levels of efficiency can be attained by examining records such as yields, soil tests and manure and fertilizer usage. Finally, they offer a reduction in liability for producers. In the event of an accusation of environmental mismanagement, records help defend practices and document responsibility. Historically inspections have primarily been complaint driven. However, all NPDES permitted farms will be inspected by a regulatory agency at a routine interval (typically once a year); depending on the state, smaller AFOs may be included in a routine inspection schedule as well. Inspectors are looking for compliance with the permit and associated nutrient management plan, and that required management practices are documented. They will also look for any signs that indicate a discharge has occurred. One producer’s solution to record management. It is very helpful for a producer to conduct or initiate an educational or non-regulatory mock-inspection. This can be done with the confidential help of a third party. In some states, Extension may be able to assist. Additionally, many states may make their inspection protocol available. EPA has published a fact sheet titled: What to Expect when EPA Inspects Your Livestock Operation. Other tools are available, such as the nationally adapted Farm*A*Syst self assessment modules. These may not specifically address a permitted operation, but they help address environmental risk and liability based on practices. Conducting modules with farm/ranch staff or your county agent may give insight into areas that need improvement prior to a visit from regulators. Participating in a USDA-Natural Resources Conservation Service program may also offer an opportunity for a general assessment. Once again, this may be helpful in identifying critical areas, though likely will not directly address regulations. If a consultant is employed by the operation, that person may also assist in assessing the operation prior to a regulatory inspection.